The winner of the Fuzzrocious Rat King Give Away sent me a photo of his prize amongst a couple of other goodies. Ron also sent over his thoughts on the pedal as well. thanks for the pedal! i’ve included a picture of it with most of my other ToNeCaNdY!!! 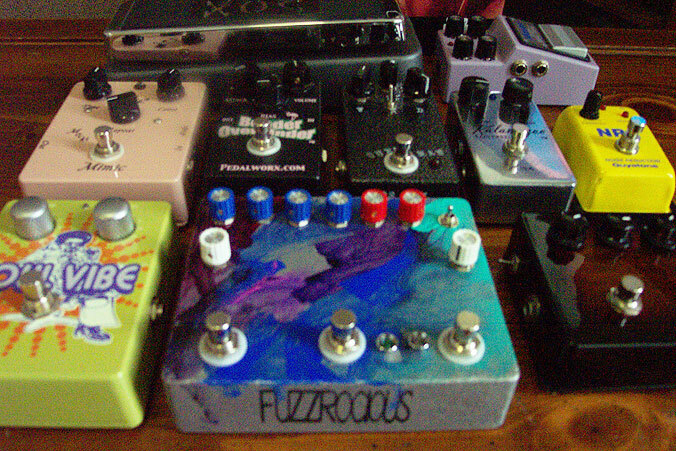 i made sure you could read ‘fuzzrocious’ in the picture. i played around with the pedal for about an hour or so, and here are some thoughts from a guitar hobbyist. 1. diode/open selector – i understand this is to make it bass friendly, but i like it; especially, for classic tones like cream and hendrix. 2. hi/lo filters – i like cutting the bass for twelve bar blues patterns and cutting the treble a bit for classic tones like cream and hendrix. 3. solid construction and quiet. 1. i’m unsure how stage friendly this would be, but you can use glow labels and markers, etc. it depends . . . . are you going for one sound or more? i couldn’t imagine playing with the dials on a dark stage. a hobbyist might find it overwhelming because they may dial something in and play a bit and dial something in that’s a better ‘cop’ of what they were seeking. what i’m doing with it, but my dog rascal’s head cocked every which way. a criticism on my notes is that i used a tele baja player, and i believe i would’ve liked to both try it with my fender deluxe american strat and a washburn custom v with classic classic (bridge) and a ’59 (neck). i also wonder if it might not be a good pedal for heavier rythmn patterns of some types of metal music that i don’t play. Again, I would like to thank Chad Bass EFX and Fuzzrocious Pedals for making this give away happen. Please support these guys by visiting their websites!